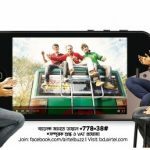 Welcome to all Robi users to know about the Robi YouTube Video Streaming Package 2GB 27TK, 7GB 74Tk & 30GB 219Tk Offer. 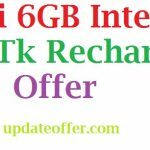 Bangladeshi most popular and one of the biggest telecommunication company Robi has come to their valuable subscribers to activate special 2GB 27Tk Offer, 7GB 74TK and 30GB internet only 219Tk offer. So today I will share all more update information how can activate to this special YouTube and my sports offer. The users who want to activate this special offer, just read this full content with attentively. Here we will share all more instruction to activate this offer. Robi Prepaid subscribers are eligible for the EL recharge offer (except easyload & uddokta). Robi Prepaid & Postpaid Subscribers can purchase the USSD packs. To check remaining internet balance and validity dial *123*3*5#. 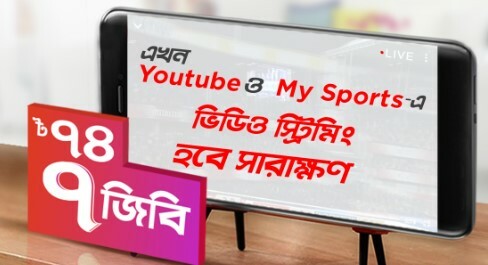 Now all customers have got more information to know about the Robi YouTube Video Streaming Package 2GB 27TK, 7GB 74Tk & 30GB 219Tk Offer. If you want to know more or faced any problem to activate this offer, just comment the box. Thanks to all for being with as.